The DAD009 is the UK’s first and only certified Secured By Design Letterbox, designed and manufactured to police preferred specification. Whether you wish to protect your personal mail, or your companies commercial mail, the secured by design letterbox is perfect! A robbery is a frightening experience, yet sadly the UK see many committed daily, with 80% of burglaries through front doors, making a secured by design letterbox essential. Compared to a traditional letterplate, this letterbox will not suffer arson attacks or theft. Its secure 5 pin rim lock complete with 3 keys will ensure only pin or key holders have access to the mail/possessions inside the box. Traditional letterplates are not heat efficient allowing a draft to enter your home, with continuos noise pollution too, is that something you could live without...? 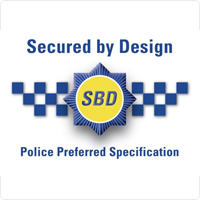 A certificate for our secured by design letterbox is available on demand. It's 1.5mm thick electro-galvanized steel is powder coated, with a few different colours to choose from. Ideal if you wish to coordinate it with your interior. With its 10 year guarantee, patented anti fishing device, hinge protector and locking mechanism, its secure features will put your mind at rest. Its anti drill, bump and pick lock makes it secure from any non key holders manipulation attempts. A unique key number would be allocated to you, if you wish to order new keys, yet another form of security. For size dimensions and futher information, view our DAD009 secured by design letterbox. It can be delivered to you as quick as 2 - 3 weeks, so what are you waiting for, don't let criminals steal your mail...act today and protect what is yours!